"Eclipso Rising" - Part 5: "The Destined and the Dying"
As seen last issue, Eclipso has split the moon in half. The gravitational changes are causing widespread devastation on Earth. The change is so sudden and dire, and the disasters so widespread, that Earth's meta-humans are fighting a losing battle to save lives and property. On that severed moon, the Justice League needs to act fast to correct this dangerous situation before it deteriorates further. Batman urges his team on to battle, telling them to free Zauriel, who was captured by Eclipso last issue. Jesse is still mourning the loss of her super speed due to a severed connection to the speed force. Jesse still has her super-strength, however. She worries that she would be useless to the team without it. Each JLA member has a specific goal or target as they enter into battle. Alan Scott attempts to free Jade from Eclipso's control, but is thwarted by Eclipso. We look five minutes earlier, and see the JLA members plan strategy before jumping into battle. Batman indicates that the mission is two-fold: fight against Eclipso, and free Emerald City from Eclipso's mind control. Batman reiterates that the Shade is the key to solving the current crisis. Unlike the other victims who are completely under Eclipso's control and in a mindless state, the Shade is behaving as if he has free will and is acting voluntarily. But Batman and Obsidian believe that Eclipso has partial control of the Shade, and is deceiving the Shade into believing he is free from Eclipso's influence. Obsidian says that the Shade's will is strong, and that if Eclipso tries to take total control of the Shade, he will break free. Obsidian reveals that the Shade's shadow powers are stronger than his own, allowing Eclipso to use the Shade as the conduit to control all the others on a massive scale. So if they free the Shade, they free everybody. Having been summoned by Saint Walker at Batman's request, the Atom shows up. Batman wants Atom to take Mikaal with him and enter the Shade's brain. Batman wants Bill (Congorilla) to launch them into their target using a rifle whipped up by the Blue Lantern. Batman warns Bill not to miss. A moment later, the maneuver is a success, and Atom and Starman find themselves within the brain of the Shade. Batman continues to speak of freeing Zauriel. Eclipso blocks their path. But then it becomes clear that Zauriel is a decoy, and Eclipso is the true target. Donna acts decisively, and lands a powerful blow to the face of Eclipso, sending him reeling. Back in the strategy session of a few minutes ago, Saint Walker reveals that the one person present who has the power to take Eclipso on directly is Donna. He indicates that her trials and challenges, including death and resurrection, have given her great inner strength. Atom and Starman travel inside the brain of the Shade, heading towards the centers of higher thought and memory. They are looking to see if that part of the brain has been hijacked by Eclipso. They get their answer quickly when they confront evil looking spiders in that region of the brain. Donna feels somewhat elated as she pounds Eclipso; believing that all she has been through has prepared her for this moment. But elation quickly turns to horror as Eclipso uses his sword to slice and dice Donna's blue magic lasso. As she recoils in shock, he plunges his sword right through her in what appears to be a fatal incident. He snarls and challenges the JLA, saying "Who's next?" Story - 3: Although I have been enjoying the Eclipso story arc, this one had some flaws and inconsistencies that pulled the quality down a bit. At the end of last issue, Eclipso had split the moon in half! Read that last sentence again. This is no routine occurrence. This is a cataclysmic event that should have huge repercussions. And we do in fact see a huge impact on the Earth, with every available superhero scrambling to fight the natural disasters that result. But what about on the moon? I am no astronomer or physicist, but cracking the moon in half should certainly produce drastic changes to the moon's orbit and gravitation that would render the moon uninhabitable, in rather violent and dramatic ways. But this did not happen. It is pretty much business-as-usual on the moon, with no evidence at all of devastation except for a one-sentence comment by Congorilla, mentioning tremors when he is aiming his blue rifle. If one of the heroes, Alan Scott for example, is using his powers to prevent catastrophe on the moon, than why isn't this mentioned or explained? For that matter, the devastation on Earth would ordinarily cause Earth's metahumans to drop everything and head to the moon in a hurray, to attempt to put the moon back together and eliminate the danger. Why doesn't this happen? OK, so Superman and Supergirl are busy battling a handful of Doomsdays, in Action Comics. But what about the other heroes? Another inconsistency regards the power level of Eclipso. In this series, Eclipso has been portrayed as a heinous villain of godlike proportions. He can split the moon in half with his sword! He can defeat the mighty Spectre in battle! So how is it that after a simple pep-talk from Saint Walker, Donna is able to land a hard punch and send Eclipso reeling? After all the hype about Eclipso's power, I am just not able to buy into this. If he was godlike last issue, he should be no less formidable this issue. Saint Walker says that Donna will be the key to defeating Eclipso. And if Saint Walker says it, then I believe it. But who is going to patch up the new hole in Donna's torso? Is she headed for death and resurrection, round two? In the DCU, death just does not mean what it used to. This next point is not an error, but I did find it odd. On page one, Robinson showed the Eremites of the Divine suffering from what he calls demented rapture. He must have done this for a reason. But what is the reason? Will they participate in the resolution of this crisis? If so, how? Or are they somehow under Eclipso's spell? This is never explained. Page one feels out of place from the rest of the book. I hope it is explained next issue. Next month, this story will go to part six. This story is just not strong enough to justify half a year of storytelling. Robinson is stretching things a bit, in my opinion. But of course, this is a "lame duck" Justice League. James Robinson has given us an eclectic JLA roster, featuring the likes of Starman and Congorilla, for Pete's sake. And I have mostly enjoyed his storytelling. But with the impending Justice League relaunch, this version of the JLA is winding to a close. We will soon be treated to basically the classic Justice League roster: Superman, Green Lantern, Wonder Woman, Aquaman, and the others. I for one am pretty excited about this prospect. Art - 3: The artwork is uneven this time around. Some images look great, like the picture of Saint Walker's makeshift blue rifle (probably digitally rendered) on page twelve, or the close-up of Donna at the bottom of page 16, showing Donna's surprise and uncertainty after Saint Walker singles her out as the hero to face Eclipso one-on-one. But Atom looks really *off* on page 18. Look at Superboy in action on page 3. The threat in this story is epic; but the artwork does not really rise to that level. 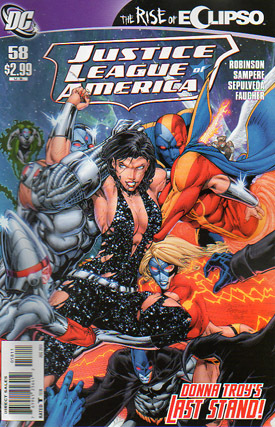 Cover Art - 4: Donna Troy battles alone, as Cyborg, Red Tornado, Jesse Quick, Bulleteer, Batman, and other heroes gang up on her. Donna's face shows determination in the face of overwhelming odds. This scene does not occur in the story; but it symbolically conveys her struggle and emotions as she faces off against the powerful Eclipso. I like this cover. It is a very dynamic image. With your imagination, you can almost see her wriggling to break free from the grasp of the heroes who are attempting to hold her down. 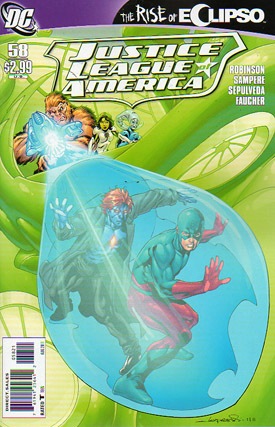 Cover Art (Variant Edition) - 4: Congorilla fires the blue rifle in our direction, and we see a close-up of Atom and Starman inside the bullet and heading towards their fantastic journey. I love the concept and layout of this cover.